It may resemble a retro cassette tape, but the iMainGo portable speaker is anything but old school. All the sound systems in your house will be jealous of this lightweight powerhouse from Portable Sound Laboratories. IMainGo Founders Tim Jacobus (on left) and Jorge Ragde seen here with rapper Akon are making a big impact with iMainGo. It’s designed for use with an iPhone, iPod touch, iPad, and other MP3 players, and it doubles as a protective case (you don’t even have to open it to control the music). You can take it to the park, the beach, the backyard or wherever you want to share your music -- iMainGo delivers the boom, without the box. The big sound comes from iMainGo’s high-output titanium speakers, paired with tuned porting for bass reproduction and a digital music amplifier. The iMainGo 2 model runs on four AA batteries, while the iMainGo X uses a rechargeable lithium-ion battery. The iMainGo X also has a few more whistles and bells, including two headphone jacks so you can listen with a friend, plus a microphone jack so you can sing along with your music, karaoke style. There’s also an auxiliary jack that lets you use the iMainGo X as an external stereo speaker system for any device with a 3.5 mm connection -- laptop, cell phone, electric guitar, you name it. The iMainGo XP is designed for use with an iPad and includes a stand perfect for gaming, theater, and presentations. The iMainGo XP comes with rechargeable lithium-ion batteries for up to 8 hours at full volume. The best part of iMainGo is that it’s high tech but not high priced. It’s easy to use and a total crowd pleaser – even among finicky (and notoriously hard to buy for) teens. My name is Leonie Darcel and I am so excited that the Daily Grommet is featuring our iMainGo portable speakers and the story behind them today. I first heard the iMainGo back in 2007 when I was on a beach holiday and I was really blown away by the sound and design of the speaker. I loved that I could listen to my music all day and not worry about getting sand in my MP3 player!! Several months later I joined the team at Portable Sound Laboratories and now I get to share my passion for the iMainGo speakers on a daily basis! I hope you will love the speakers as much as I do. They really will make perfect holiday gifts for anyone with an iPod, iPhone or MP3 and I’m here to answer any questions you might have. does either model come with an AC adapter? Are the speakers wi-fi enabled or must they be connected directly and only to the I pod? I was one of the testers and have to say that everyone who hears the sound out of this little package is just blown away. And how cool to control your touch screen device from the outside. @Emily: The iMaingo X has the AC adapter and rechargeable lithium batteries. Once fully charged this model will run for 12 hours. @Wendy Chandor: Duly noted for Wi-Fi, great suggestion! I got one today for my 14 year old. And she is just learning to play guitar and to sing, so the mic plugin will be useful. Great Grommet! 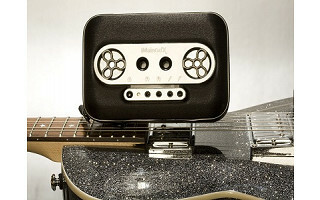 @Anne-Marie Kovacs: Another feature of the iMainGo X is that as well as being able to use it as a 'mini-amp' for the electric guitar you can also play music on your iPod at the same time, so your daughter will be able to play along to her favorite songs! 1. Does this fit an iPhone 4? 3. Will the speakers work to project phone calls, for example if I wanted to sort of do a mini "speaker phone" call? 4.The surface is covered with neoprene fabric (similar to wetsuit material), so is water-resistant. will this fit a droid X phone? @Tammy: the Droid X is a little too long to go inside the units, but they can still be used as external speakers. @Leonie Darcel: thank you! I figured it would be too big - appreciate you confirming and expanding on that a bit. Would it work with a Zune 80? Or perhaps a Droid Incredible? @RR: Both the Zune 80 and Droid Incredible will work with the speakers. The Zune 80 will also fit inside either the iMainGo 2 or the iMainGo X however the Droid Incredible is a little too long to fit inside the iMainGo 2. Thanks. Can I use an 'old-school' Nano with this? @Breck: Hi Breck, yes - you can absolutely use your 'old school' Nano with either unit! Do you still need to use earphones for this? Also, how many watts does it put out? However the iMainGo X's extra features include 2 headphone ports on the outside so that you and a friend have the option to listen via headphones if you want to. The speakers put out approximately 5 watts. Thanks. @Breck: Hi, yes the 'old-school' Nano will work with either the '2' or the 'X', just use the memory foam included to ensure a snug fit against the touch screen. Will my son's iPod Classic fit? @Stephanie: Hi Stephanie, yes your son's iPod Classic will fit in either the iMainGo 2 or the iMainGo X! I love my iMainGo. My 10 and 13 year old boys love listening to their music while hanging out with there friends. @merylt: The iMainGo X is the more robust option. It has rechargeable lithium batteries (with plug in charger) instead of using AAA Batteries. 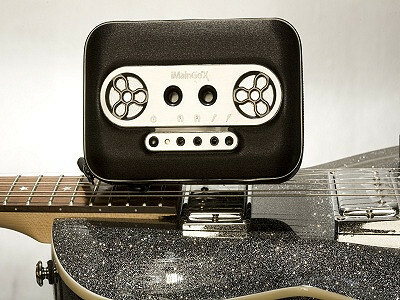 It includes 2 Headphone jacks, a mic, and can be used as a mini amp. It is slightly larger than the iMainGo 2 and so can fit devices that are a bit larger. @Breen: Yes, the small players work too! Does this unit have the ability to run off a car charger? @madapddler: I have forwarded your question to Leonie. Thank you for posting! @madapddler: Great question! We will be releasing a specific iMainGo X car charger before the end of the year but in the meantime you can use the regular charger with an inverter car adapter. Thanks for posting. @Caroline: This will work with any device that uses a 3.5mm connection including an iPad. An iPad is too big to be tucked inside the protective case but it can be used externally. will this work with a sansa clip mp3 player? Also, would it be ok to use in the cold next to a hottub? @june barnes: June, you are painting an interesting scene! I will have Leonie stop by and let us know how it works in the cold. @june barnes: I have been in touch with iMainGo and their units have functioned fine from desert to ski slopes, so they are confident the side of your hot tub will not be a problem. Your mp3 should do fine as well. Dang, I was so close to loving the iMaingo. Hate the name of this, by the way. First off I want to say the service was just so-so. I tried to contact Grommet right after I ordered this because I realized that I accidentally put it on the wrong credit card and wanted to change it. Tried calling (got a recording) and sent two emails - with neither being returned. On the positive side, I received my 4 iMaingos in record time, about 2 days. That said, I popped my Droid 2 into the thing and it was a perfect fit (even with the hard plastic case. It was almost made for it. Snapped right in, perfectly. I was thrilled until I went to zip it. TOO SNUG. Not the fault of the Droid, either. It's like you need a mini shoe horn to keep the zipper on the outside. It wants to go inside due to the tightness. Might be workmanship problem. The first corner zips just fine. Going round the second one was nasty. I know it's going to bug me. OK. The sound... It's fantastic. Better than expected. Very, very nice. Love it, love it except for that nagging defect. I also have to find out how to adjust volume with touch rather than on outside of phone (inside the case). Don't know if I can. It will bug me if I have to unzip the thing just to adjust the sound. Also would like to adjust tone with touch. Don't know if I can. If not, that is not a big deal. Will I return it? Depends on how much the zipper thing bugs me. I would love for this to be custom made for my phone with holes on the outside to reach in to the buttons and zip properly. It would be fantabulous if it could do that! Maybe iMaingo should make these for all the phone companies and all the individual phones. They would make gazillions. @mommywithsix: Thank you for stopping back with your feedback! I am forwarding it to Leonie and to our customer service department as well. I have been looking for something like this for quite some time now. I do have a few questions. I am an avid golfer (as are a lot of people-hint hint! ), will there be any golf accessories available for this? A 'clip' to attach to the golf cart or a pull cart would be helpful. Have you considered an external volume control for devices w/o an exposed touchscreen? There used to be a product called the 'bonefone' which was a radio with speakers that wraped around your neck. I could see where there would be a use for this style of speaker system. I do not like wearing headphones when I ride my bike because they block out the enviroment around me(including cars and other bikers or runners)There is a link below to an old Bone-Fone ad. I know this is a lot to address but I see that you have a very innovative product and I think there is oppertunity for an expanded line in the marketplace. @Thom: Great ideas that I will pass along. Companies are always evolving their product lines and your input will be valuable as they explore new lines. As far as your bike riding, we actually have another product that is a perfect fit. It is the CycleSound system and it fits underneath your bike seat. I purchased the iMaingoX recently. It arrived in record time. I was very anxious to try it out but followed the directions to charge it first. I plugged in my ipod, turned it on and just about blasted myself across the room. The sound from this unit is AMAZING! I also like the fact that my ipod fits inside the unit so it is protected from the elements. I am so happy that I don't have to mess around with the present gadget I have when I want to listen to my music in the car. The material the case is made from is easy to clean with just a damp cloth. Well done!!! @Natalie: We are delighted that you are happy with your purchase and equally delighted that you stopped back to share your experience. Thank you! I recently purchased the iMainGo X. I wanted to be able to play music via my android phone when working on projects without headphones. I was so impressed by the sound. I had to show it off to my music/tech son. He gets paid to find new music technology. He was humoring me until I plugged in the music. His eyes grew wide and he started really looking it over! The sound is so rich for such a small, portable unit. I am very pleased with this purchase. @Lynn: You scooped your son! We're thrilled that you love your purchase. Thank you for stopping back to let us know! I want to listen to some mp3 audio files while driving my car. Can it be powered/charged from my vehicle cigarette lighter with some sort of adapter? OTherwise I have to burn about 12 cd's to listen to the audio files the traditional CD way. A portable device is the cost effective answer and it provides alternative uses outside of my vehicle. @LC-Mass: There is an adapter available. I will send you more information directly. Could this be used for a zumba (exercise class) and be loud enough. The room is most likely 20 x 30. @Angi: That is a great question. I am going to test it out and will let you know! @Angi: I demoed the iMainGo X yesterday in an approx 20-30 room full of 30+ students, their general consensus was that yes the sound would fill a similar size room for a Zumba class, obviously it will depend on the specific room’s acoustics, but it should be ok. The volume is rated at 88 decibels. I would love to hear any feedback from you if you choose to get it! Great questions! I have sent Leonie a note and will let you know. Thanks for stopping by. I'm in a steel drum band that plays at the beach with out any plug in power. We use a sound system hooked up to a marine battery with an Ipod for the backing tracks. Would this work any better? "The iMainGo X is a portable speaker for ipods/mp3’s etc, it has the rechargeable battery that will last for 11-12 hours per charge so it is great to take anywhere. It does have awesome sound, its maximum volume reaches about 88 decibels. But without knowing what sound system you are using there is no way of knowing how it would compare especially in terms of volume and/or range." My daughter wanted an Ihome so that she could keep her phone charged as she listens to her music on her Iphone...so my question is, will she be able to charge her phone regularly (plugged into wall) and also listen to her music on the I MainGO X.? @Oahuspirit: I am double checking and will let you know! @Oahuspirit: The iMainGo X does not have the capability to charge the iPhone directly, however it is totally possible to have the iPhone plugged in and charging while still using the iMainGo X, although the iPhone won’t fit inside the X while it is being charged because of the connector, it is the same as using the iMainGo as an external speaker for laptops, tablets or larger smart devices. I often have both my iPhone and iMainGo X charging at the same time while playing music. Does the iMainGo2 have the same sound quality as the more expensive model, and does it have an AC Adaptor? How long will it run on the 4 batteries? @ Betty: The iMainGo Team has this to share: The iMainGo2 does not come with an AC adaptor. The iMainGoX comes with one. While the iMainGo2 has very good sound quality, the iMainGoX has superior sound. The battery life is up to 30 hours on four AAA batteries. You can read more info at the DETAILS tab (below video & photos). Do these units work well with the new, slightly larger iPhone 5s? I love the idea for listening to music or audio books while doing daily chores in my house..I really dislike headphones and prefer external speakers. It may resemble a retro cassette tape, but the iMainGo portable speaker is anything but old school. All the sound systems in your house will be jealous of this lightweight powerhouse from Portable Sound Laboratories. IMainGo Founders Tim Jacobus (on left) and Jorge Ragde seen here with rapper Akon are making a big impact with iMainGo. It’s designed for use with an iPhone, iPod touch, iPad, and other MP3 players, and it doubles as a protective case (you don’t even have to open it to control the music). You can take it to the park, the beach, the backyard or wherever you want to share your music -- iMainGo delivers the boom, without the box. The big sound comes from iMainGo’s high-output titanium speakers, paired with tuned porting for bass reproduction and a digital music amplifier. The iMainGo 2 model runs on four AA batteries, while the iMainGo X uses a rechargeable lithium-ion battery. The iMainGo X also has a few more whistles and bells, including two headphone jacks so you can listen with a friend, plus a microphone jack so you can sing along with your music, karaoke style. There’s also an auxiliary jack that lets you use the iMainGo X as an external stereo speaker system for any device with a 3.5 mm connection -- laptop, cell phone, electric guitar, you name it. The iMainGo XP is designed for use with an iPad and includes a stand perfect for gaming, theater, and presentations. The iMainGo XP comes with rechargeable lithium-ion batteries for up to 8 hours at full volume.